This instrument is rather unusually made of ivory with the different components inset in gilt brass. A brass clasp closes the box. Set into the top of the lid is an instrument for finding the time of high tide at particular ports, consisting of a fixed disc with two scales and a volvelle. The outer fixed scale is laid out as an hour ring, numbered clockwise twice I to XII, divided to 1/2 hours. The inner fixed scale is marked with 16 compass points indicated by their first letters. The volvelle with a pointer is inscribed with the age of the moon 1 to 291/2 days, numbered by 1 and divided to 1/2 days. Set into the inside of the lid is a lunar volvelle consisting of an engraved plate and two movable discs each with an index. The plate is inscribed with two circular scales: a Julian calendar with the English names of the months ('Ianuarie, February, March, Aprill, Maye, Iune, Iuly, August, Septemb, October, November, December') and the corresponding number of days (numbered by 10 and divided to 2); and a scale marked with the usual Latin names of the zodiacal signs (each with a 30? scale, numbered by 10 and divided to 2). The larger disc shows the age of the moon 1 to 291/2 days, numbered by 1 and divided to 1/2 days. The smaller disc is marked with an aspectarium. A circular aperture shows the phases of the moon. 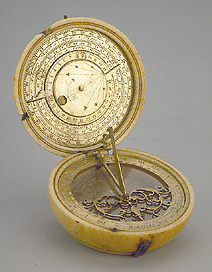 A horizontal dial consisting of an hour ring and a pierced folding gnomon with pierced decorative strapwork is fixed to the inside edge of the bottom on the instrument. Set into the bottom itself is a magnetic compass with a painted beige compass card in yellow, orange and green. Thirty-two points are indicated with the eight main points marked in full, the others marked with their first letters. A 360? scale around the compass rose is numbered by 10 and divided to 2. The hour ring of the dial is marked IIII to XII to VIII and divided to 1/2 and 1/4 hours by alternate shading. The name of the maker 'C Whitwell' is inscribed between the lines for 4 o'clock a.m. and 8 o'clock p.m. The instrument was purchased in 1854 and is described in F. A. B. Ward, A Catalogue of European Scientific Instruments in the Department of Medieval and Later Antiquities of the British Museum (London, 1981), p. 24 ff., no. 17.